﻿ Real Madrid 2-1 Galatasaray. Marcelo showed how it's done! 18.08.2015 » Real Madrid 2-1 Galatasaray. Marcelo showed how it's done! Cristiano Ronaldo made his return to the team after missing 3 straight games in this year's pre-season and helped Real Madrid beating Galatasaray by 2-1, thanks to goals from Nacho and Marcelo. With this win, the Merengues kept the Bernabéu trophy at home and are now ready to debut in La Liga this next Sunday. Real Madrid needed a late second half goal from Marcelo to see off a determined Galatasary side, as Rafa Benitez's squad finished off their preseason with a 2-1 victory in the Trofeo Bernabeu. Cristiano Ronaldo returned to the Merengues' lineup after being left out for 3 consecutive friendlies this month, but against all odds, it would have to be two defenders delivering the decisive blows on the Turkish side. 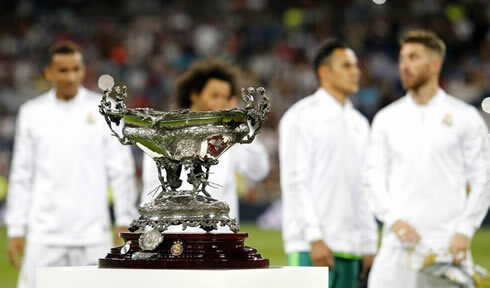 Nacho with a strong header and Marcelo with a stunning solo goal late in the second half, made sure that the Bernabéu trophy would stay home for another year. This Sunday, Real Madrid debuts in La Liga against Sporting Gijón. With James Rodriguez and Dani Carvajal on the bench, and Raphael Varane and Karim Benzema out, Benitez stuck to his decision to play Gareth Bale in the "10" position, and by and large Madrid looked decent in the first half. The changing of positions was nice to see. Isco floated in from the right and switched positions with Bale often, the Welshman in particular seemed to really benefit from being more involved in teams buildup. It's a far cry from last season, when Bale would usually receive the ball on the right flank, where he would be quickly isolated leaving all the intricate interplay to happen down the left flank. On the 17th minute, an unlikely source however would net the opener... Rising high to meet a Luka Modric corner was none other than Nacho Fernandez, who placed a well-timed header into the corner of the net. Still, despite getting the opener, Madrid struggled to score. Cristiano Ronaldo missed a number of chances, most notably from a quickly-taken Bale throw in, and a clear opportunity after Jesé centered the ball to him in the center of the box. Both chances were excellent and though Ronaldo seems a bit rusty it's also a good sign that the team were looking fluid. The second half was a different story and in many ways, it largely resembled the more frustrating parts of last season. Madrid largely began to rely on hopeful crosses into the box, instead of building through the middle. This allowed Galatasaray to get comfortable as Madrid's attack slowed to a halt. The Turkish side even equalized through the former Madrid player Wesley Sneijder. With some space at the edge of the box, he put an excellent left footed strike past an outstretched Keylor Navas. Eventually, it would take a moment of brilliance from Marcelo to break the deadlock. With nothing but Galatasary defenders in front of him, he began his dribble, shaking one, two and eventually three players before slotting a left footed shot into the corner of the net for the winner. Cristiano Ronaldo next game for Real Madrid will be on the 23rd of August of 2015, against Sporting Gijon. You can watch Juventus live stream, Sporting Gijón vs Real Madrid, Athletic Bilbao vs Barcelona, Celtic vs Malmo, Valencia vs AS Monaco, and Hertha Berlin vs Werder Bremen, all matches provided from our soccer live pages.